Technologies for severe environments make systems robust enough to handle extreme conditions in space and on Mars. 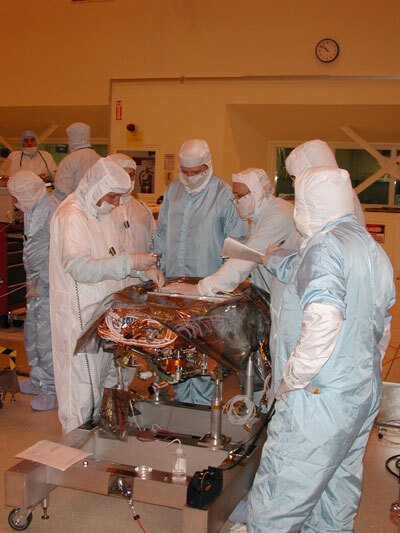 A group of engineers and technicians works on the rover's warm electronics box (WEB) that houses the avionics, or 'brains,' which are crucial electronics that control rover movement and instrument deployment. This box-like feature is located in the center of the rover. Each radioisotope heater unit produces about one watt of heat and contains about 2.7 grams (0.1 ounce) of plutonium dioxide as a pellet about the size and shape of the eraser on a standard pencil. Each pellet is encapsulated in a metal cladding of plutonium-rhodium alloy and surrounded by multiple layers of carbon-graphite composite material, making the complete unit about the size and shape of a C-cell battery. 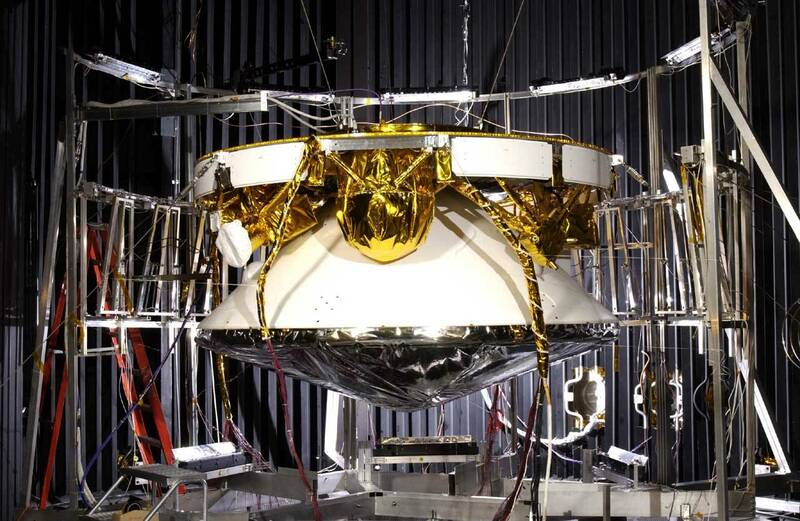 This design of multiple protective layers had been tested extensively, and the heater units are designed to contain their plutonium dioxide under a wide range of launch and orbital-reentry accident conditions. 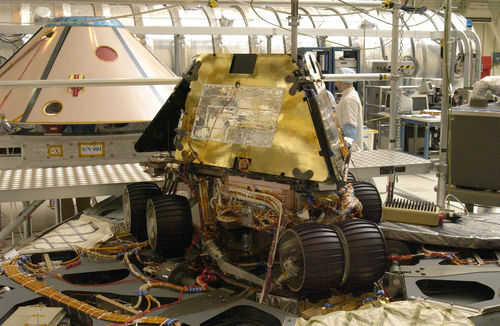 Other spacecraft, including Mars Pathfinder's Sojourner rover, have used radioisotope heater units to keep electronic systems warm and working. What did the Mars Exploration Rover mission landers have in common with Dracula? Batwings! The Spirit rover sits (in the stowed configuration) atop its lander which is enhanced by fabric ramps, whimsically referred to as "batwings." The ramps were conceived as a way of increasing the rovers' exit paths off of their landers. In order to give Spirit and Opportunity more avenues for exiting their rovers, engineers developed fabric ramps to span the void between the lander petals. Testing showed that the twin rovers could only withstand a small drop off of their rover onto the martian surface, without causing damage. It also proved that, even mostly deflated, airbags could form balls and knots that would raise the lander deck height to unsafe levels. Mechanical engineers had to rise to yet another challenge. "We were told that, due to the extremely limited space inside the lander, the solution had to weigh nothing, that we couldn't use pyrotechnics to deploy it and that we couldn't take up any space," said Kevin Burke, the lead engineer for the egress hardware. "It was a real shoehorn job!" The batwings are made of silicone-coated Vectran, the same synthetic material out of which the airbags were fashioned. Vectran has almost twice the strength of other synthetic materials, such as Kevlar, and performs better at cold temperatures. Weighing in at about 6 kilograms (just over 13 pounds), the batwings and the ribs that support them weigh significantly more than nothing. But they are a passive element and were activated by the deployment of the petals themselves (so they didn't require separate pyrotechnic devices). 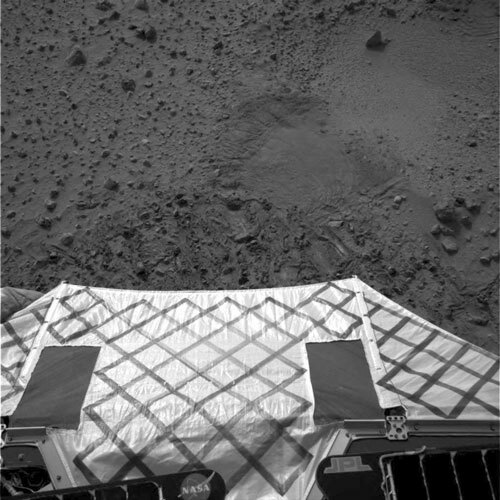 The criss-cross pattern on the batwings allowed the rover cameras to easily identify how the fabric was behaving after deployment; for example, it might have been taut and perfectly ready for egress or it might have taken on a curved shape due to bunched-up airbag material underneath it. It was extremely important to carefully observe all pathways off of the rover before exiting. This image shows the view from the Mars Exploration Rover Spirit after it successfully completed a 115 degree turn to face northwest, the direction it will roll off the lander. The image was taken by the rover's navigation camera. "You can't bank on just going straight off the lander," Burke said before the rovers landed on Mars. The batwings provided just the additional "wiggle room" the rovers would need. The additional paths gave both rovers about 180 degrees to egress from their landers. Although Opportunity's egress was nearly a picture perfect one - right off of the front of its lander - Spirit's was not. One of the airbags that cushioned Spirit's landing was blocking the "off ramp." Ultimately, Spirit made a 120-degree turn and exited off of one of its batwings.